Veronica and Marty Barillas never thought the word "horse" would mean so much to them. Nine years ago, their son Nico was born with Down syndrome. He's mostly nonverbal and communicates with an iPad app. Veronica and Marty are always looking for ways to enrich his life and find ways to teach Nico to express himself. When they learned "horse therapy" was being offered in the Austin, Texas area, where the family lives, they signed Nico up. It seemed like the perfect fit. "He's always had this incredible relationship with animals," Veronica said. Watchdog Mary first introduced you to Nico earlier this year after he requested people bring supplies for foster dogs instead of presents to his birthday party. So off Nico went, one day a week, to horse therapy. He loves putting on his helmet and gear. When Nico rides he’s accompanied by physical, occupational and speech therapists. One day Nico came back from his walk on the horse and two of the therapists were crying. “My wife thought something horrible happened," said Marty. "It turned out while he was on the ride Nico said ‘horse’ three different times! They were tears of joy. When my wife heard the news, she started crying too!" Veronica describes it as a moment she will never forget. "When I heard the word 'horse' come from his mouth, I was shocked because Nico had used very few words prior to that. It will do down as one of the best moments in my life to date," said Veronica. Licensed Clinical Social Worker and canine specialist, Katherine Martin, told us she was not surprised about Nico's breakthrough. 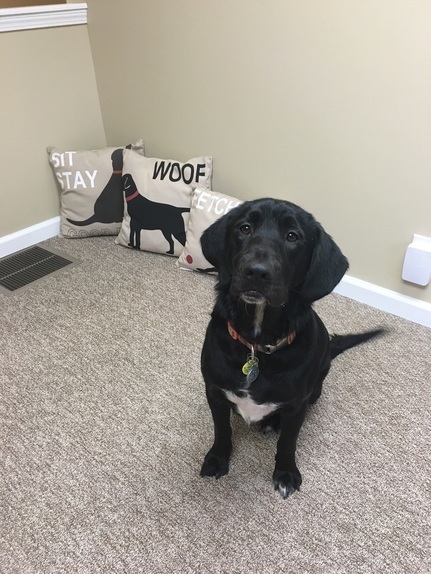 Martin runs Canine Assisted Therapy and Healing, “CATCH” in Indiana. Her partner is a black Labrador rescue dog named Drake. She saved him after he was thrown from a car by his prior owner and had to have a leg amputated. Drake right after being thrown from the car and after surgery. He was flown to Indiana by "Pilots for Paws." Now Drake helps patients feel welcome and at ease in Martin’s office. Molly Crossman, a researcher in Yale University’s Psychology Department, studies the influence of animals on people. Nico continues to thrive at horse therapy and seems to have found his favorite word. "When my wife picks Nico up at school he points to his chest and says, ‘horse.' It’s a significant breakthrough. It’s very exciting," said Marty.